History on a Plate is the series title of innovative radio documentary programmes that take real recipes from Irish food history and put them back on the menu. 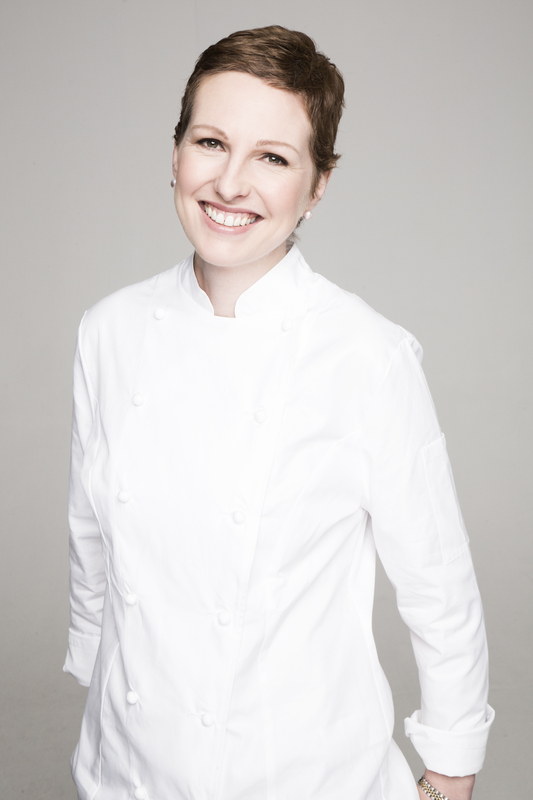 The presenters are historian Juliana Adelman and Irish Times restaurant critic Catherine Cleary, while Irish Times food writer and chef Domini Kemp re-creates the long-lost recipes. The recipes used in the series are courtesy of the National Library of Ireland. Programmes 1-6 were first broadcast on Fridays at 7 pm from 5 July 2013 to 9 August 2013 on RTÉ lyric fm. Re-broadcast on RTÉ Radio One at 7:30 pm from Saturday 11 October 2014. Programmes 7-12 (Series 2) broadcast on Saturdays on RTÉ Radio One at 7:30 pm between 22 November 2014 and 10 January 2015. Series 1 was nominated for the Celtic Media Festival Awards 2014. Catherine Cleary and Juliana Adelman serve up history on a plate. 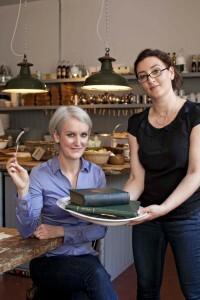 (left) Irish Times food writer and chef Domini Kemp who recreates the long lost recipes in each programme. 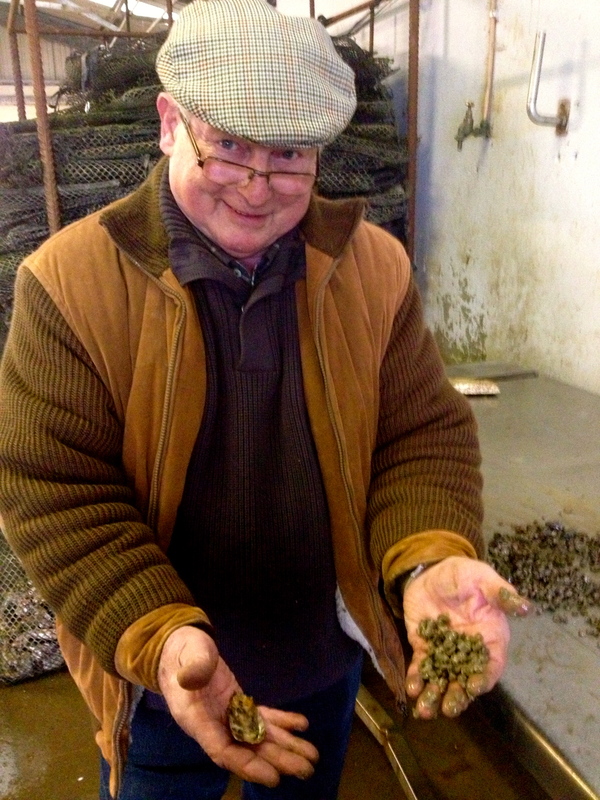 Photo: Jim Harty, Dungarvan Shellfish, who appears in Programme 1. 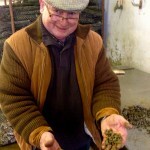 Programme 1 tells the tale of the wild Irish oyster, cheap, plentiful and found in unusual places like a nineteenth century recipe for lamb and oyster sausages. Presenters Juliana Adelman and Catherine Cleary look at the original handwritten recipe in a manuscript in the National Library, travel to Arklow to talk to an expert about a time when the economy of the town was built on oyster fishing, and how the boom turned to bust, and look at the evolution of modern oyster farms with a visit to one of the country’s largest producers in Co Waterford. Food historian Mairtín Mac Con Iomaire explains how the oyster was the fast food of its day, while chef Domini Kemp cooks this unusual oyster sausage recipe. The programme ends with a tasting. The contributors to the programme are Domini Kemp; local historian Jim Rees; food historian Mairtín Mac Con Iomaire; and Jim Harty, owner of the Dungarvan Shellfish. The reader is Doireann Ní Bhriain. Programme 2 looks at the potato – the ingredient that dominates Irish food history – and considers the contrast between how the rich ate potatoes and their place in the diet of the poor. Historians Cormac Ó Grádá and Dorothy Cashman talk about a history of hunger and plenty that surrounds the potato, while Jonathan Bell, former director of the Ulster Folk and Transport Museum, brings us into a cottage to show us how potatoes where cooked, and in the Museum of Country Life in Castlebar curator Clodagh Doyle demonstrates a range of utensils used to cook and mash potatoes. In this episode Domini Kemp cooks a potato pudding made with sugar and eggs, and the programme ends with Domini and the presenters tasting this unusual and very Irish dessert. The contributors to the programme are: chef Domini Kemp; historians Cormac Ó Grádá and Dorothy Cashman; Jonathan Bell, former director of the Ulster Folk and Transport Museum; and Clodagh Doyle, curator with the Museum of Country Life. The reader is Doireann Ní Bhriain. Programme 3 tells the fascinating story of a French celebrity chef’s visit to Ireland in the depths of the famine to build a model soup kitchen. Soyer’s biographer, Ruth Cowen, describes the flamboyant French man and explains how a man who cooked for the rich produced such a thin soup for the poor, and how his trip to Dublin started the small relief efforts to combat mass hunger. Economic historian Cormac Ó Grádá reminds us of official responses to the crisis and chef Catherine Fulvio tells us about a surprising discovery on her family’s land, while in the kitchen Domini Kemp cooks Alexis Soyer’s famine soup with vegetable trimmings and just a tiny portion of meat. Finally, food historian Mairtín Mac Con Iomaire describes the impact of foreign chefs who followed in Soyer’s footsteps. The contributors to the programme are: chefs Domini Kemp and Catherine Fulvio; historians Cormac Ó Grádá and Mairtín Mac Con Iomaire; and biographer Ruth Cowen. The reader is Pierre Heuzé. When the river on your country estate produced dozens of salmon in a time before fridges you had to find some way to preserve them. Programme 4 in this series re-creates a recipe for potted salmon from the papers of Townley Hall, a middle-sized country house in Co Louth. Fisheries expert Christopher Moriarty tells us about the gentry’s access to salmon, while food historian Dorothy Cashman describes the varied and interesting diet of the rich and middle classes in 19th century Ireland. Presenter Juliana Adelman visits Townley Hall in the company of historian Patrick Walsh to hear how a dinner party guest might have enjoyed it. Finally, Domini Kemp and the presenters taste a salmon that uses spices that modern day cooks would never dream of combining with salmon. The contributors to the programme are: chef Domini Kemp; historians Patrick Walsh and Dorothy Cashman; fisheries expert Christopher Moriarty; and Fidelma Heany, caretaker of Townley Hall. The readers are Doireann Ní Bhriain and Brian De Salvo. In programme 5, Juliana visits the Ulster Folk and Transport Museum and hears from former Curator of Agriculture Mervyn Watson about the Grow More Food campaign of the 1940s, and from the former Director of the Museum, Jonathan Bell, about the transformation in tractor technology. Catherine meets Percy Lovegrove, who has been growing his own food for the past 70 years, and Michael Kelly, founder of the more recent Grow It Yourself campaign. Domini Kemp cooks two recipes from Maura Laverty’s pamphlet Flour Economy, published when Ireland was suffering a wheat shortage in the 1940s, and one (oatmeal bread) turns out to be rather more appetising than the other (fried slices of leftover porridge). The contributors to the programme are: chef Domini Kemp; Jonathan Bell, former Director of the Ulster Folk and Transport Museum, and Mervyn Watson, former Curator of Agriculture at the Museum; veteran vegetable-grower Percy Lovegrove; geographer Ruth McManus; and Michael Kelly, founder of Grow it Yourself. The reader is Doireann Ní Bhriain. Clips of Maura Laverty’s radio programmes are from the RTÉ Sound Archives. The fashion for foraged, pickled and preserved foods seems to have dawned with the Nordic food revolution in the last decade. But programme 6 of History on a Plate finds a 19th century recipe in an Irish manuscript for pickled samphire which shows just how old these methods are. Juliana Adelman visits Townley Hall in Co Louth to see their ice house, and the Museum of Country Life to see their collection of preserving jars, while Catherine heads for the beach with Marie Power to collect edible and nutritious seaweed, a wild food which is perfect for drying. We hear how the rural electrification scheme transformed what and how we eat, with chef Darina Allen talking about her memories of jam-making day, life before refrigeration, and the rare treat that was ice cream from a neighbouring village. And we talk to a former Irish Noma chef about whether this rediscovery of old methods is a food fad or the future. The contributors to the programme are: chefs Domini Kemp, Darina Allen and Trevor Moran; historian Patrick Walsh; seaweed expert Marie Power; and Clodagh Doyle, Curator at the Museum of Country Life. The reader is Doireann Ní Bhriain. Archive material is used courtesy of the San Pellegrino 50 Best Restaurant Awards and ESB Archives. Episode 7 explores the connection between bread and beer. We visit Guinness to hear more about the role of yeast in brewing beer, and Tartine Bakery to find out how to make bread the old-fashioned way. We make our own home-made barm from beer, sugar and flour and attempt to use it to make barm brack … with unforeseen results. The contributors to the programme are: chef Domini Kemp, baker Thibault Peigne, food historians Regina Sexton and Vibse Dunleath, and Guinness microbiologist Angela Larkin, master brewer Gearoid Cahill and archivist Deirdre McParland. The reader is Doireann Ní Bhriain. In this episode Domini Kemp recreates a recipe for Indian Curry found in the National Library of Ireland and the presenters explore how the Irish taste for curry developed from the time of the Irish men who helped run the British empire, to the first Indian restaurant in Ireland in the twentieth century, right up to a spice importer and restaurant owner of today. The contributors to the programme are historians Michael Kennedy and Jonathan Wright, John Langham, chef Nisheeth Tak, and Arun Kapil of Green Saffron. The reader is Doireann Ní Bhriain. In this episode Domini makes home-made lemon cheese, and the contributors to the programme are cheese makers Siobhan Ni Gharbhith and Seamus Sheridan and historians Regina Sexton and Jonathan Bell. The reader is Doireann Ní Bhriain. In this episode Domini Kemp attempts to make home-made bacon for Catherine and Juliana, with a warning ringing in their ears from butcher Derek Bolger that if they don’t get it right the meat might turn rancid. The contributors to the programme are butchers Derek Bolger and Pat O’Doherty, art historian Claudia Kinmonth, and Mervyn Watson, formerly of the Ulster Folk and Transport Museum. The reader is Doireann Ní Bhriain. In this episode we ask if food can act as a cure. We hear about some early cures (powdered mouse, anyone?) and the more appetising-sounding Drogheda uisce beatha, made with whiskey, and Spanish Flummery, made with generous quantities of wine. The contributors to the programme are historians James Kelly and Ida Milne, nutritional cook Susan Jane White, whiskey expert Dave Broom, and Trevor Stanley, Museum Secretary of the Irish Workhouse Museum in County Laois. The reader is Doireann Ní Bhriain. In this episode the presenters ask why many Irish people won’t eat eel. Are we missing out? And as for whale meat… don’t even go there. The contributors to the programme are fisheries expert Christopher Moriarty, Anthony Creswell of the Ummera Smokehouse, Icelandic food writer Nanna Rögnvaldardóttir, chef Stephen Toman, Pat Close, Chairman of the Lough Neagh Fishermen’s Co-operative Society, and eel fishermen David and Richard McElroy. The reader is Doireann Ní Bhriain. 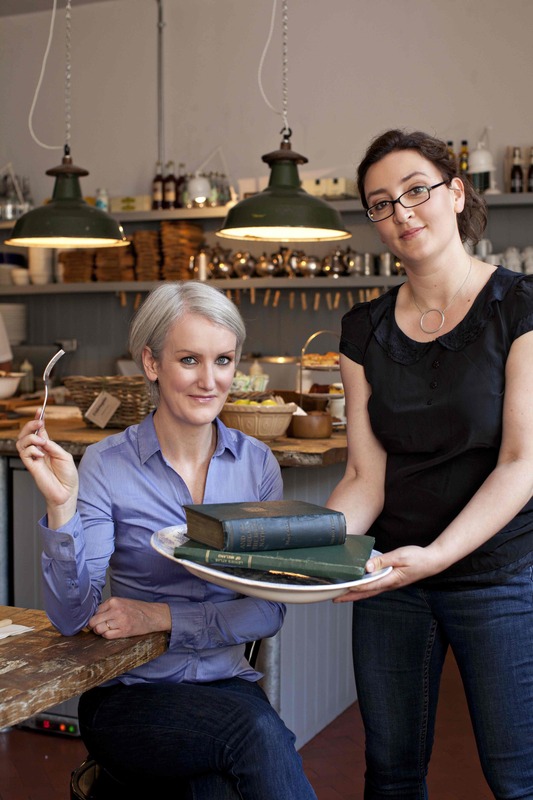 History on a Plate is written and presented by historian Dr Juliana Adelman and restaurant critic Catherine Cleary. The programmes are produced by Claire Cunningham. Programmes 1-6 are a Rockfinch production (www.rockfinch.ie) for RTÉ lyric FM. Programmes 7-12 were produced for RTÉ Radio One. History on a Plate was funded by the Broadcasting Authority of Ireland with the Television Licence Fee. The History on a Plate team took part in the WW1 ROAD SHOW in Trinity College Dublin on Saturday 12 July 2014. Domini Kemp and Catherine Cleary made two presentations on THE FOOD OF WORLD WAR 1 in the Front Square of TCD and some brave audience members sampled cold Maconochie’s stew, a staple of the soldiers’ diet. The Road Show is a collaboration between RTÉ, TCD and the National Library of Ireland.